Happy Cinco de Mayo to you! How many of you are in an area that celebrates it? 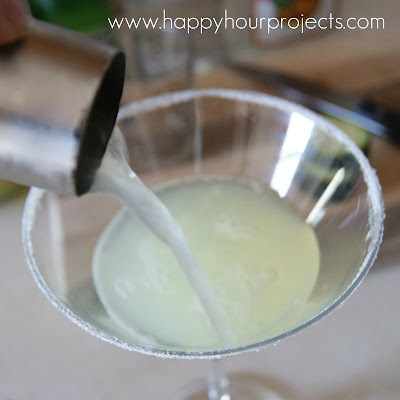 My husband bartends at a Mexican restaurant, so he will be up to his elbows in margaritas all night tonight. So I thought today would be fitting to share a little drink I finally perfected at home a few weeks back: my Cucumber Martini! I enjoy beverages that are off-the-beaten-path. I especially like original martinis, and this one, I am proud to say is *truly* original. There are certainly variations out there – I didn’t invent the whole idea, or anything – but this recipe came from our house! I will give you the recipe first, and then I’ll walk you through a little bit of the prep. There are a few things you’ll have to make before you can mix it up, but they are quick things and can be done well ahead of time, so that all you need to do when your guests arrive is shake up a couple and relax! If you’re new to the world of specialty martinis… welcome! There is one ingredient that pops up a lot, and that’s simple syrup. Simple syrup is equal parts of sugar and water (I make my batches one cup of each at a time), heated in a saucepan on low heat, until the sugar dissolves. 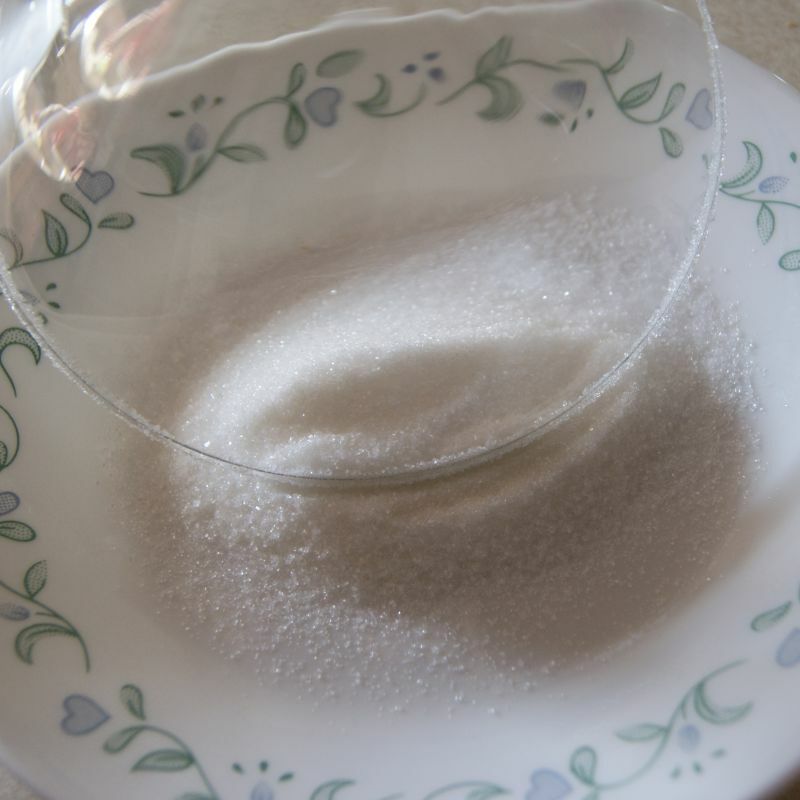 It takes about 5 minutes to make a small batch of simple syrup – your sugar will dissolve before your water comes to a boil. 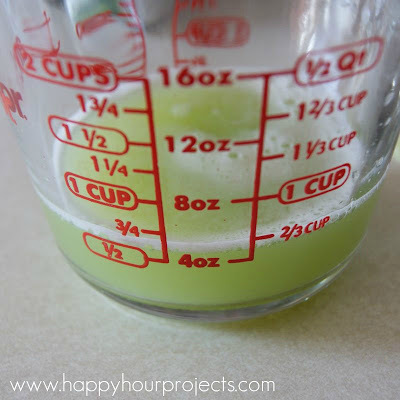 I didn’t photograph this step because I had some on-hand, but if you’d like photographs of a syrup I made recently to see how it looks once the sugar dissolves, you can visit my post about the lemon-basil gimlet. Perhaps you’re wondering about how in the world you’re going to juice a cucumber. You’ll need a blender or a food processor for this step – to my knowledge, you can’t just buy this as an ingredient. 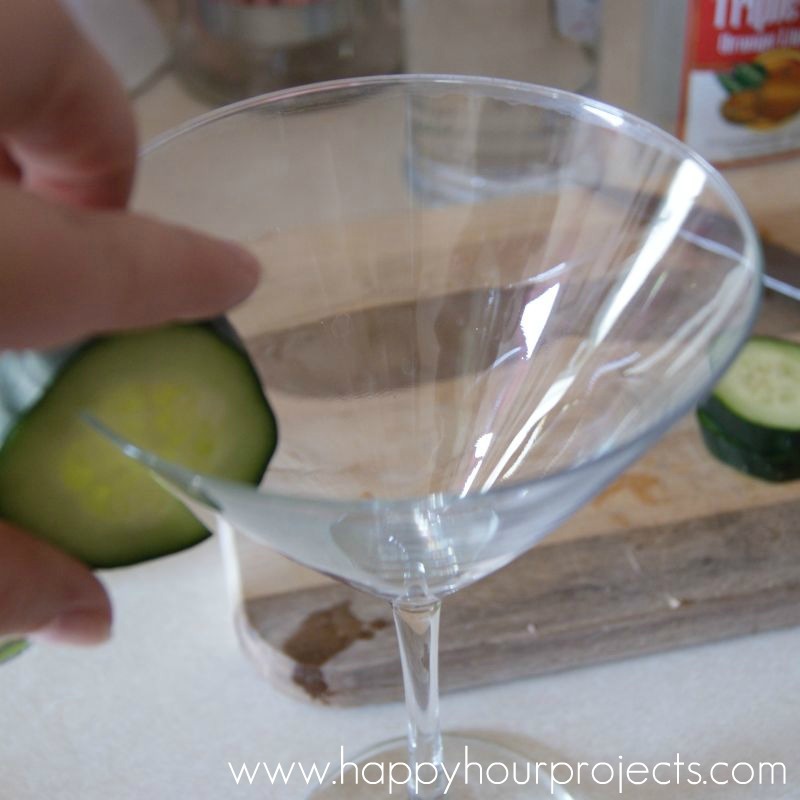 Wash your cucumber well, and cut off a few slices to set aside for your garnish. Then, peel what’s left and cut it into chunks (this will make it easier for your food processor to handle). Puree it. You want it as close to liquefied as possible. You may find that adding a tablespoon or so of water makes this process go more smoothly. Then, you’ll strain your puree to remove anything solid. 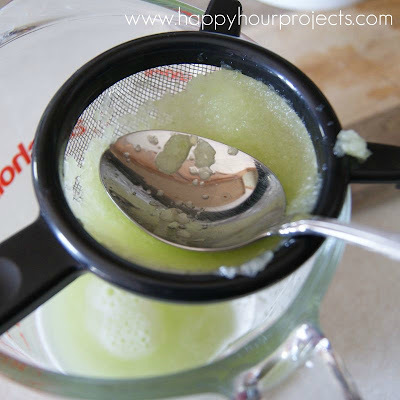 Place your strainer over a bowl (I used a measuring cup and my small strainer) and spoon your puree into the strainer. You can press down on the puree to squeeze as much juice as possible out – if a bit of pulp comes through, that’s okay. Any pulp small enough to fit through your strainer will be fine. Simple sugar lasts in the frig for months in a sealed container. I just use a Mason jar for mine. I’m not sure about the cucumber juice; I try to use fresh ingredients like this within three days. But you can certainly prepare these ahead of time to save yourself the work later. Now, to shake it up. For this, I really do advocate owning a shaker tin, though professional bartenders have been known to shake up drinks using two glasses stacked together. I’m no pro, so I use my tin. Fill your tin with ice. This is how you’re going to chill your drink. Now, measure your ingredients in. I always recommend a top-shelf vodka when you’re making martinis. Effen even makes a Cucumber Vodka that would be perfect here, but I used what we had in the house already. Looked up a cucumber drink cuz that’s what I had a craving for. Saw this and had all ingredients on hand…OH EM GEE…Was so delish! 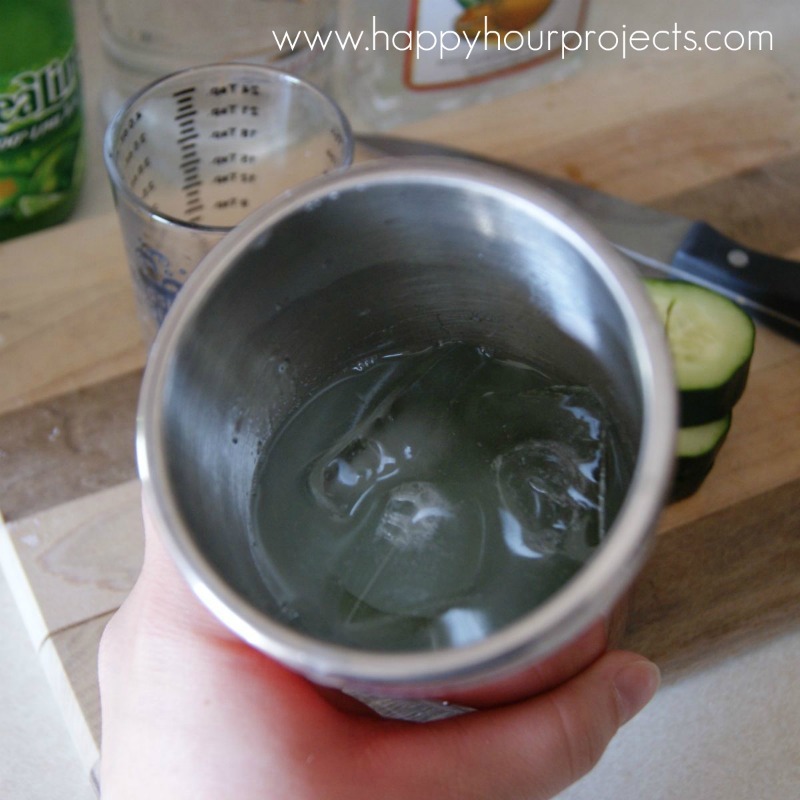 Have you tried this with Cucumber Vodka? I have some and wondered if you’ve used it before. It’s a great alternative! Just whipped up a batch with effen vodka. 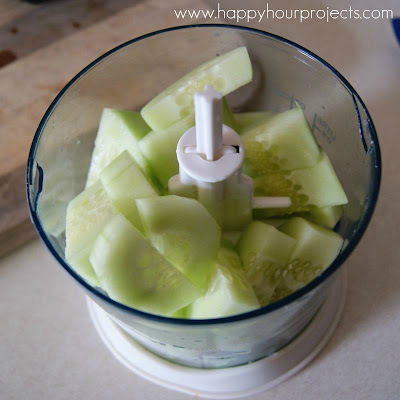 to save time, skipped pressing the cucumber pulp to squeeze out the liquid, and just used the pulp in the shaker. excellent recipe! Pinning this 'cause I need me a drink! This look so refreshing and delish! Thanks so much for sharing at Mom On Timeout! oh yummy! I so want one! Thanks for sharing! These look amazing and I wanted to mention that your photos are spectacular. 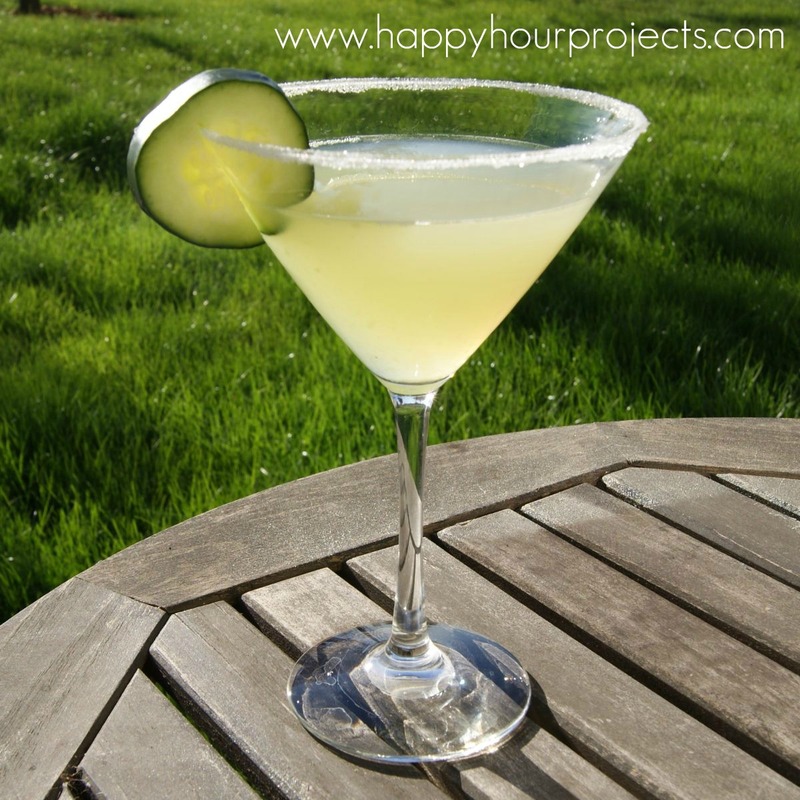 I especially love the finished product photo – totally makes me want a martini for breakfast. :) Thanks for sharing at our party this week. Yum! Can't wait to try this by the pool!!! Pinning it! Mmm, never thought to make one with cucumber. I might just have to try it out! Thanks for the visuals, that always helps. This drink look so refreshing. I used to be a bartender, but it was so long ago that I don't remember many of the recipes. Thanks for sharing at Show & Tell. These look delicious!! Perfect for Cinco de Mayo! !